In this guide, lets consider creating a simple web application with Spring Initializr. Creating a Web application with Spring Initializr is very simple. Screenshot shows the project structure of the imported maven project. 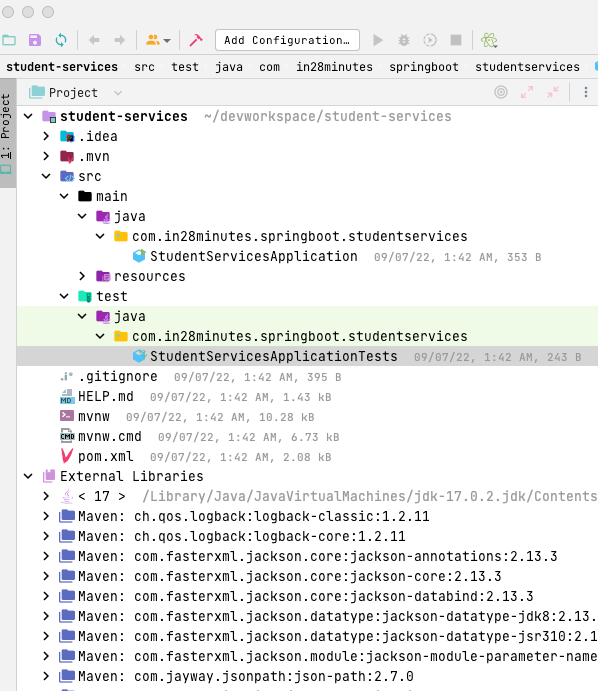 StudentServicesApplication.java - Spring Boot Launcher. Initializes Spring Boot Auto Configuration and Spring Application Context. StudentServicesApplicationTests.java - Simple launcher for use in unit tests. pom.xml - Included dependencies for Spring Boot Starter Web. Uses Spring Boot Starter Parent as parent pom. Three important things that are configured in pom.xml. Spring Boot Parent Pom - You can read more about Spring Boot Starter Parent here - http://www.springboottutorial.com/spring-boot-starter-parent. Spring Boot Starter Web - You can read more about Spring Boot Starter Web here - http://www.springboottutorial.com/spring-boot-starter-projects. @SpringBootApplication - Initializes Spring Boot Auto Configuration and Spring application context. Read more about Auto Configuration here - http://www.springboottutorial.com/spring-boot-auto-configuration. SpringApplication.run - Static method to launch a Spring Boot Application. Integration test launches the complete Spring Boot Application. Read more about integration tests here - http://www.springboottutorial.com/integration-testing-for-spring-boot-rest-services. Following log is generate when you run StudentServicesApplication.java as a Java Application.